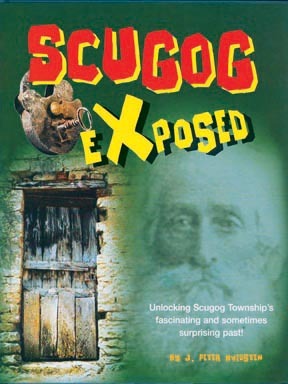 Specifics: Scugog Exposed is a beautifully illustrated book containing 148 pages, and has been written and designed to attract new readers to the fascinating history of Scugog Township. It features stories about the first settlers of Port Perry, Reach, Scugog and Cartwright Townships, to folklore, scandal and murder during the 19th century. Short concise stories.... hundreds of illustrations and pictures. A must for both new and old historians. Printed by: Citizen's Communication Group Inc. 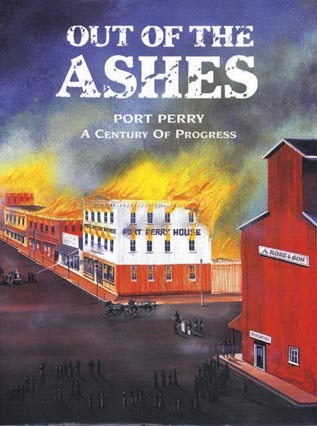 Specifics: Out Of The Ashes is a hard cover book containing 302 pages, which features more than 1,000 pictures of buildings, street scenes and personalities who were instrumental in the development of Port Perry and the surrounding communities during the 20th Century. Printed by: Citizen's Communications Group Inc. Specifics: Scugog: Merchants Of Old Port Perry surveys this quaint village located on the shores of Lake Scugog. The 215 page, hard cover book investigates the attractive Victorian buildings and properites, tracing their commercial and social history. Printed by: Port Perry Printing Company Ltd. Specifics: Scugog: The Early Years is a beautifully illustrated hard cover book containing 270 pages. The book features hundreds of pictures and maps, and highlights the lives of the pioneers and entrepreneurs of the 1800s who were instrumental in the development of Port Perry, Reach and Scugog Townships. Published by: Abbeyfield Companies Ltd. Specifics: Steamboats Of Scugog provides a factual history of the era of steamboating on Lake Scugog and the south central Kawartha Lakes from the mid 1850s to the early 1900s. The beautifully illustrated hard cover book contains 145 pages and features dozens of pictures of steamboats and full color paintings by noted artist Les Parkes. Printed by: Port Perry Printing Co. Ltd. This book is available for download in Adobe PDF format. 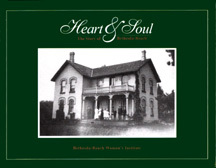 Specifics: Historic Homes & Estates takes a look at more than 50 historic and attractive homes in the Port Perry area. This beautifully illustrated 'coffee table' book features 143 pages of pictures and stories about the homes, past and present. Specifics: Hot Off The Press presents the history of the newspapers of Port Perry and Uxbridge from their meager beginnings to the present. The 142 page, hard cover book also presents short biographies and pictures of almost all of the former publishers of the newspapers. Specifics: Uxbridge: The Good Old Days provides a nostalgic look at life in the town during the 1950s and 1960s. The book is richly illustrated with hundreds of pictures of the town and leading personalities of the day. It also features pictures of many century old buildings, which were torn during this era. Specifics: Mayhem To Murder takes an in-depth look at the history of organized crime in Canada West during the 1840s. In particular it deals with the Markham Gang whose range of crimes was extensive - from petty theft to an elaborate system of horse stealing and from forgery to murder. Specifics: Stitches In Time chronicles the growth of Community Memorial Hospital, Port Perry from its earliest beginning to the present. The 212 page hardcover book also provides information about many of the early doctors, nurses and other health care workers who have contributed to the success of the local hospital. Printed by: Port Perry Star Co. Ltd. Specifics: On The Shores Of Scugog was the first hard cover book published about the history of Reach Township and the surrounding area. The 114-page book provided a glimpse into the lives of the earliest settlers, their hardships and their achievements. Mr. Farmer re-published the book in Dec. 1934, adding more pages of information to the popular document. It was reprinted a third time in 1969 by the Lake Scugog Historical Society. Specifics: Scugog And Its Environs started as a weekly column in the Port Perry Star in 1926, but due to its popularity was published as a 144 page hardcover book in August 1927. The book deals primarily with life on Scugog Island during the early years of settlement, but also provides valuable information on the history of Ontario County and other neighbouring municipalities. It also features a few pictures and illustrations.